A blog or two back, I noted that our story “The Summer Cottage Mystery- A Children’s Story” did surprisingly well in Japan. The story centers around some “child detectives” search for a lost cat, so I speculated that the success in Japan might have something to do with cats and Japanese culture. Mostly, I was just extrapolating from the “Hello Kitty” phenomenon. Maneki-neko or "beckoning cat" figurines are good luck charms found in homes and businesses throughout Japan. Usually taking the form of a calico cat, it calls out to customers, visitors and passersby with an upraised paw. There is some debate as to the significance of which paw is raised. 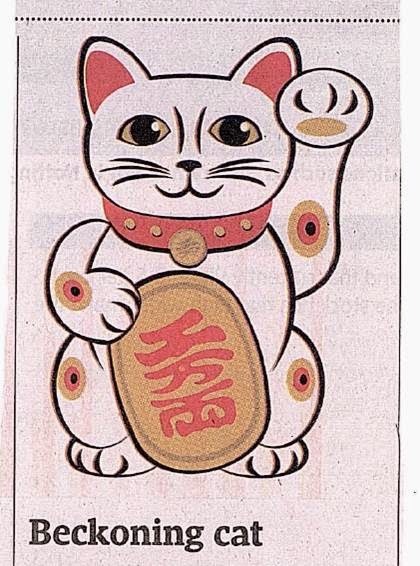 Likewise, there is much uncertainty as to the lucky cat's origins but most likely it dates back to sometime during the Edo period (1603-1868). Maneki-neko are often seen wearing a gold medallion representing a coin from the Edo period, with the inscription noting its value, 10 million ryo. The medallion reinforces the notion of good fortune or wealth. So, the positive associations with cats go back a long way in Japanese culture.